Ola, Bonjour, Salve, Ciao, G'day and, indeed, hello from me as I return with another side-splitting installment of the Caption Competition. 1. I will post a potentially funny picture and you horrible lot will post me as funny a caption as conceivably possible. The funniest caption equals a point. for your team. 2. There are two teams: retiarii and Murmillones. Each team gains one point for every winning caption. 3. Each team starts with three people, gaining another person every round (if there is two people wanting to) eventually resulting in literally several people on each team. 4. The event will last until the last Friday of October. 5. No OVERLY rude jokes. 6. Each round lasts till everyone has posted, but if you haven't posted within a week of the round start we will move on regardless. 1. You will need the brain of a five year old. I don't care if you think you're thirty. You ARE five. 2. *sighs* Yes, ducks CAN talk. 3. What!? You want more tips!? Last edited by rio_uk on Sat May 26, 2007 12:39 am, edited 1 time in total. You will be our first Retiarius (singular). Add me in! I am willing to <s>insult yo' with rude and sarcastic jokes</s> competite in this competition. Gnaaye is am being t3h Murmillo Uno. I will join Murmillones, please. Is there still another spot in Murmillones, I'd like to join it! Never worry Treeckos are here! And Gardy steals the last spot for the win. as those red people things. Note: Murmillones and Retiarii, as Shadow Deoxys will tell you, are types of gladiators. "Yes, laugh, you foolish humans with your equally foolish games. 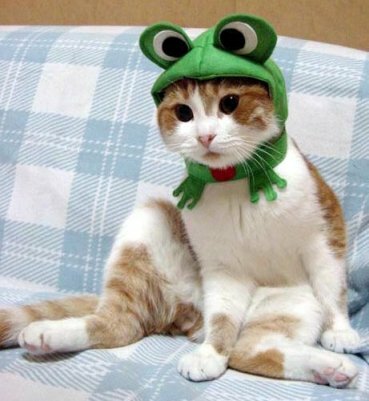 Someday, cats will rule the world, and we'll see who's wearing the stupid frog hood then!" I'll joi the blue tem in the next round! This is very similar to the caption contest in SPPF, which i own and love! "Dah-ling,it's da new style. No, the style is not having your head swallowed by a toad." "POLITOED POLIPOLIPOLI - wait, you say it's not Halloween yet? I thought it was... um, nyaa?" OMG the frog is swallowing the cat !!!one11%'!! Do I really sound like I am 5? Lawl haha. Last edited by Gnaaye on Sat May 26, 2007 12:18 am, edited 2 times in total. Kitty: Mommy mommy! i got myself a new hat! Mom: Ohhh dear... is that a poison arrow frog? Hmmmmmmm i dunno, choose the team for me! I would like to join Team Retiarii when/if there is an opening. i'mma join team retiarii for the next round IF I CAN, SER. AND I HAD A REELY GOOD CAPTION FOR THAT PITSHUR. It looks like Kasey and Nyuu to join Retiarii and Dussell and ArticticPlatypus to join Murmilonnes. YAY! Right you are but they STILL have to wait until everyone else has posted. Hey, can I join? I'd like to join, umm.... Retiarii. This looks like fun. 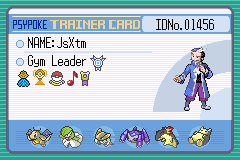 EDIT: If pokespriter wants to join that team, I'll join the other, I don't mind really. Last edited by Inta Xonem on Sat May 26, 2007 8:01 am, edited 1 time in total.